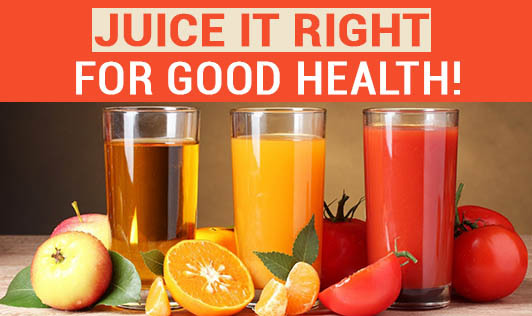 Juice it Right for Good Health! • Go slow on fruit juices: Fruits are rich in antioxidants, vitamins and minerals. They are best when eaten raw along with its fiber. Juicing is better avoided for diabetics and if you are on weight loss. Tropical fruits like mango and pineapple contain high levels of natural sugars that can soar the blood sugar levels. • Opt for fresh green vegetables for maximum nutrition: This is the ultimate way to increase your vegetable intake in the fresh concentrated form apart from the regular gravies and salads. • Our bodies cannot rely only on juices: Off late, we have come across so many fad diets that offer only varieties of juices for days and weeks without any proper meals. Juices are best when accompanied with a meal or in between meals for an energy boost! It cannot be a complete meal. • Do not juice these vegetables: Juicing raw cabbage, cauliflower or kale may not be the best juice for you as these vegetables are goiterogenic and may suppress thyroid function. • Herbs like parsley, cilantro, ginger and garlic are good for detoxification. • Use fresh lime or orange juice for a tangy flavor. Get creative and enjoy the goodness of fresh juice with your own juice recipe!